If you stick a microphone into the water in some parts of the Indian and Pacific Oceans, alongside the snapping sounds of prawns, you might hear munching and squeaking noises. The animals responsible are dugongs, also known as “sea cows”. These are marine mammals; they weigh in at over a quarter of a tonne, and, like their land-dwelling counterparts, they also eat grass - in this case seagrass. 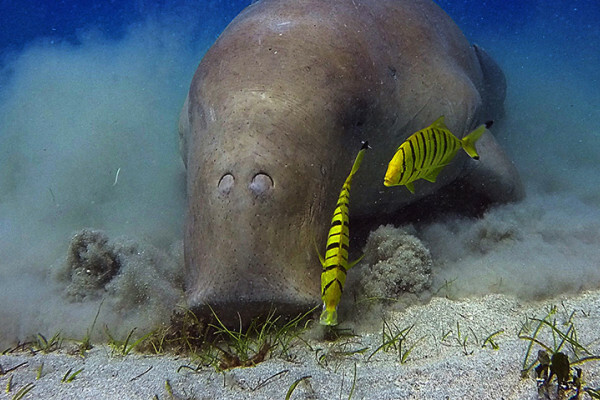 Amanda - Dugongs feed exclusively on seagrass and they actually occur throughout the whole Indo -Pacific. But unfortunately they're vulnerable to extinction largely because their seagrass habitat is disappearing and that's something that we should all be very concerned about because we all need seagrass. Seagrass feeds 3 billion people and also is extremely good at storing carbon. People don’t realise just how vital seagrass is because it plays a part in a lot of species life cycles so even things like prawns which we a lot of us love to eat, seagrass is essential. So without seagrass we wouldn't have prawns. Chris - So we could try really hard to save dugongs but if we don't save the seagrass then we’ve got no dugongs anyway? Amanda - That's exactly right yeah. So really our idea is basically to be getting people's attention on dugongs because dugongs are an excellent barometer for seagrass health so if you don’t have seagrass you don’t have dugongs. So you know, if your dugongs have disappeared, you should start worrying about the seagrass. Chris - So how are you approaching this, and how are you going to tackle a problem that’s not just one little geography, this is a worldwide problem? Amanda - Yeah it's really difficult because the best way for us to monitor dugongs is to do aerial surveys; that, traditionally, has meant putting a team of five people in a very small plane flying very low and very slow over hundreds of kilometres. Quite risky for that team and very expensive and it requires significant expertise and all of those things don't occur in most of the countries where dugongs occur. So, to overcome that problem, we have developed methods for using drones instead of planes to do that. So just basically using drones to take aerial photography of the ocean and then counting dugong images. Chris - Have drones got the range though? How big are these drones? Amanda - So I originally have trialled some pretty high end drones - the same drones that the military uses - and they work very well; they have the range and the endurance, but they’re not within their research budget of most people! So with large scale surveys we really need some new, cheap drones to be developed that can have the same capabilities. But we’re also developing methods to do more small-scale surveys, and in a lot of areas actually dugongs occur in quite small pockets; so using drones that are off-the-shelf - that people in developing countries can afford and have access to. And were developing methods to use those. So that’s really simple and user-friendly. Chris - So how will it work then? You will deploy some drones to a geography; they’ll do the aerial survey, take photos, and what can you extract from the photos, ah that’s the dugong? Amanda - So that's the tricky bit! Originally we were having to just review the images ourselves, which takes a long time. So what we've done is developed a dugong detector which uses artificial intelligence and machine learning to pick thd dugongs out of the images automatically; and so that has reduced the time it takes to view the images by 95 per cent. Chris - How do you know you’ve not spotted the same one multiple times as the sort of “Where's Wally” of the dugong world? Say it keeps popping up all over the place: how do you know you're not just double counting? Amanda - Well that's all part of the survey design so we have to make sure when we design the survey that we're designing in a way that we are unlikely to come back and see the same animal again, and we actually usually sampling of an area rather than covering the entire area. So we maybe survey 10 per cent of that area we're interested in, and then we extract from that an estimate of how many dugongs there are. Chris - And have you got a sort of "backend" for all of this so all the data coalesces, so that then you can bring together all of the different sampling sites around the world so you get a more global picture? Amanda - Well that's exactly our mission at the moment. Our vision is to create a dugong detector online hub, which would support people doing surveys all over the world so they would have access to a tool that would help them design their survey and choose the appropriate drone. And then they would download the dugong detector, which would process all the images for them. And we're going to expand the dugong detectors so that it also classifies images according to the environment that you can see, the images including the seagrass you can see there. Then they can upload all of their data from the dugong detector to an interactive map on the hub and they'll be able to create their maps but also to a global database. Chris - So it's got benefit for keeping eyes and tabs on dugong numbers and how they're getting on in the environment, but then it's a proxy marker for probably the environmental health in those regions isn't it? Amanda - Yeah absolutely. So if you’re able to do some surveys regularly and you know the dugongs have always been in this area but suddenly disappeared then that's a warning basically you need to go and check what's happening with the seagrass. Chris - And it does that mean then that you can spot areas that are either very good, and so you can then ask why are those areas so good, and equally you can spot areas which clearly show a downward trend and you can ask well what's different and why are they showing a downward trend and you can begin to tailor your interventions a bit more? Feature article on the project - "Dugongs, Drones and Artificial Intelligence"
Will Machines Take Over the World? Infection control to the rescue!